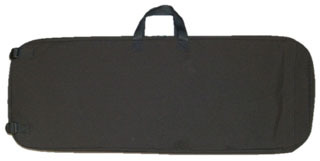 Designed as a completely plain holdall with no Exterior indicators as to the contents. Carries SA80 and Sig226 Hand Gun. 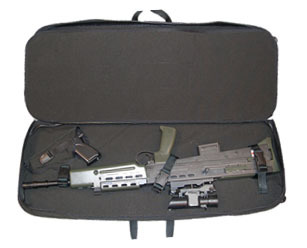 With Magazines for both weapons, 4 for Sig, 4 for SA80. 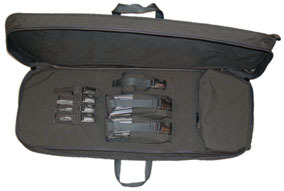 Plus additional large zipped cleaning kit pouch and smaller pouch for additional kit. Made from Cordura® with full zipped opening and Rigid 3mm polypropylene® Impact & Shatter Resistant Sheet covered in foam for extra protection. This design can be adapted for other weapons.